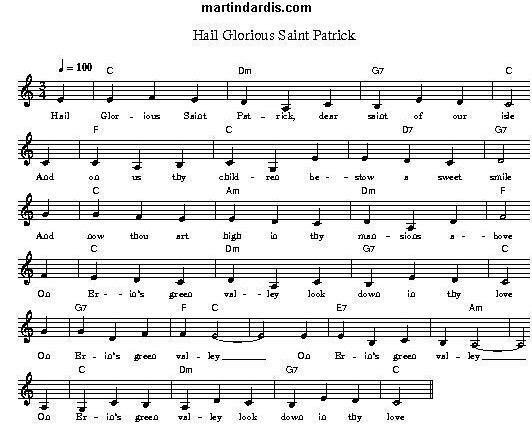 HAIL GLORIOUS ST. PATRICK 6/8 Lyrics And Guitar Chords. The chords below fit the Wolfe Tones’ version. The lyrics differ sometimes slightly and the Tones only used the verses 1, 4, 5 and the below optional verse with the optional repeat, a traditional hymn I was always very fond of and with St. Patrick's day nearly upon us what better time to include it. Guitar chords by Marc Fahrbach and another first for this site. Sheet music notes included. On (G)Erin's green (C)valleys look (D)down with your (G)love. Oh, (G)come to our (C)aid, in our (D)battle take (G)part! Their (G)banner the (C)Cross, which they (D)glory to (G)bear. Its (G)warmth undi(C)minished, un(D)dying its (G)light. For (G)God and St. (C)Patrick, and (D)our native (G)home. On Erin's green valleys look down with your love. Oh, come to our aid, in our battle take part! Their banner the Cross, which they glory to bear. For God and St. Patrick, and our native home. 15 million St. Patrick's Day cards each year. few hours on the 7 of March every year.